Treat your family to hand-knit Christmas Stockings! These knit up fast with bulky weight yarn on large needles. Make yours one-of-a-kind with your own color combinations. How about team colors for your sports fans? Simple ribbed cuff, flap heel, star toe and I-cord loop for hanging. Change the size by using lighter weight yarn and corresponding needles. Yarn: Lamb’s Pride Bulky—2 skeins will make a stocking with some left over. 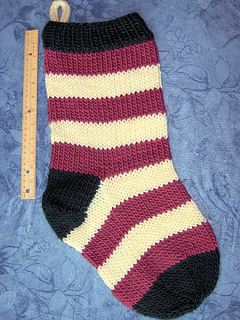 Use one color for the whole stocking, make stripes as shown here or use up your scraps. Gauge: 3 sts per inch. The gauge is not critical in this project. You will want a fairly tight, smooth fabric. If you knit very loosely try a smaller needle size.